It’s Spring, which means many things are now an absolute must; including daffodils, flowery dresses, going out without your coat on for the first time in months, and LAMB, GLORIOUS LAMB. Nothing beats spring lamb if you ask me, and I’m also a big fan of it’s favourite acquaintances: rosemary, thyme, garlic, and especially anchovies. They’re a bit of an odd couple in a kind of Voldemort and Professor Quirrell way, but I think they go together better than Kate & Wills. 1. Put the lamb, breadcrumbs, parmesan, spring onions, garlic, rosemary, anchovies, lemon zest and juice, egg and black pepper into a large bowl, and mix together with your hands. 2. Put all the couscous vegetables (minus the sundried tomatoes and olives) and garlic into a large roasting tin, sprinkle with 2 tbsp of olive oil and mixed herbs, and put in a preheated oven at 200 degrees for 1 hour. 3. Flour your hands and a board, and take golfball sized chunks of the meatball mixture. Flatten them to a depth of about 1.5cm. 5. Fifteen minutes before the veggies are done, pour 500ml boiling water over the couscous (it should be in a deep ovenproof dish), then leave for five minutes. Pop it in the oven with the vegetables for the last ten minutes to keep it warm. 6. Pour the lamb juices into a pan, add the wine, redcurrant jelly and sprigs of thyme, and let it simmer for a few minutes until it reduces. I actually wish I’d added stock and let it simmer for longer so it became thicker, so please feel free to learn from my mistakes! 7. 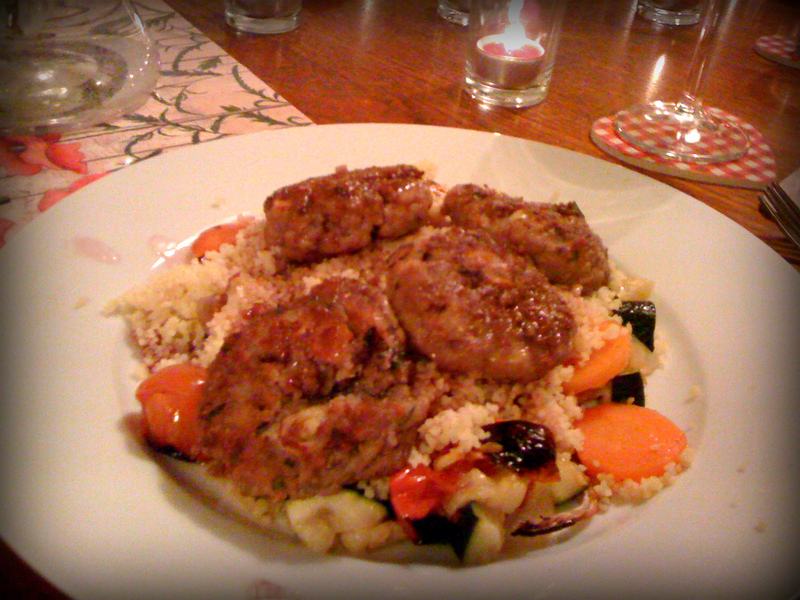 Take the couscous and vegetables out of the oven and mix them together. Add sundried tomatoes and olives. 8. Pour the jus over the meatballs, which should be placed on top of the couscous and vegetables. It proved flavoursome without being overpowering, and we all cleared our plates. It was washed down rather nicely with a bottle of Some Young Punk’s The Squid’s Fist – a blend of Shiraz and Sangiovese from Aus that blew our minds. Plus the label on the bottle is AMAZING. Photo copyright Cake, Prattle and Soul.